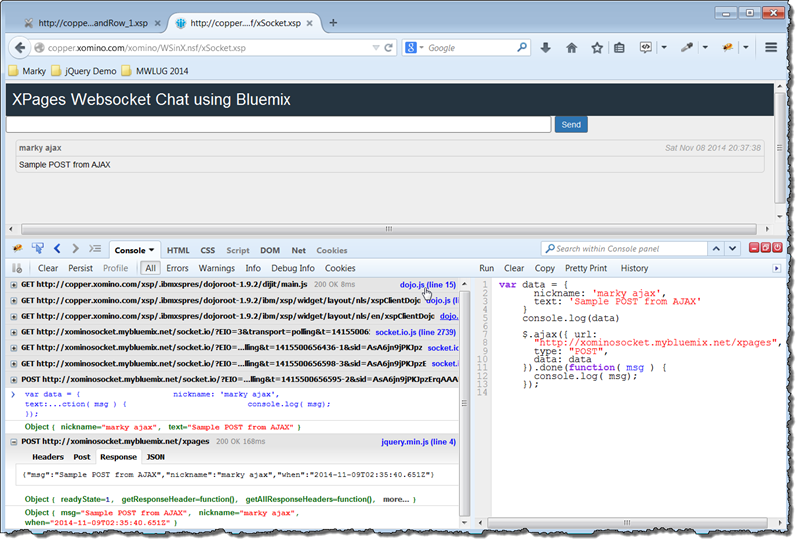 Got non-XPages design elements? You really should use WebContent. Recently I was able to help explain an issue Russ Maher was having with his application png files – http://xpagetips.blogspot.com/2014/11/got-png-you-may-get-problems.html. It got me thinking that as modern web developers (which is what XPage developers need to be), we should not be using Domino database elements for “web elements”. Back before R8 we all used the Database Files, Style sheets and Database Images as a way to reference files as part of the database. I now believe we need to stop using these altogether for “web development”. As you can see from the image above within a well structured web application css, images and js are all neatly separated out into separate folders. This makes it easy to drag and drop them from web server to web server because all the links are relative and easy to find. 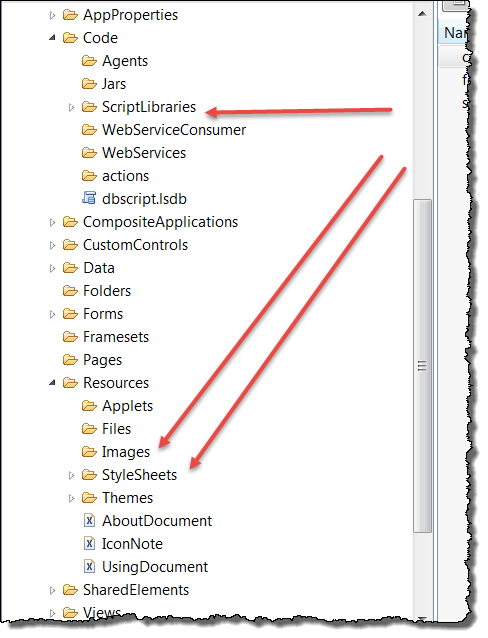 Within our WebContent folder (Accessible within the package manager Window – Open Perspective – XPages) we are able to drag and drop a web project, jQuery plugin, angular.js directive, extjs and many items and have them continue to function without any issue. 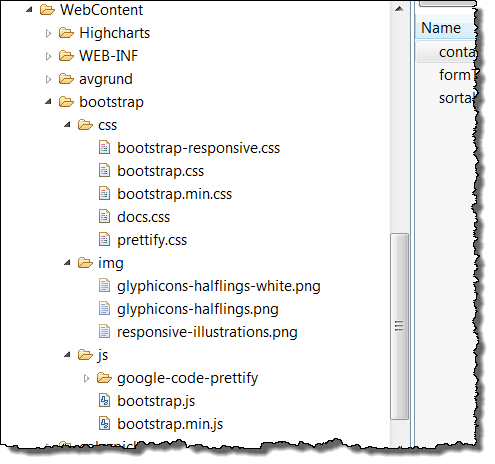 Bootstrap is another great example, well structured and easy to add to our applications. When we build out our applications and use source control the “database structure” is stored locally and then committed to our Git or Mercurial repository. 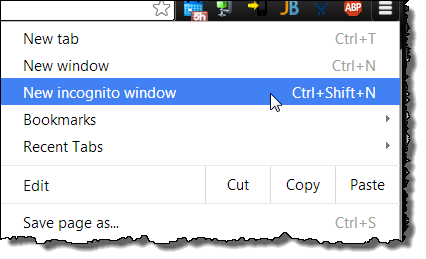 Not using the WebContent folder causes us problems when we are searching for files in this environment. 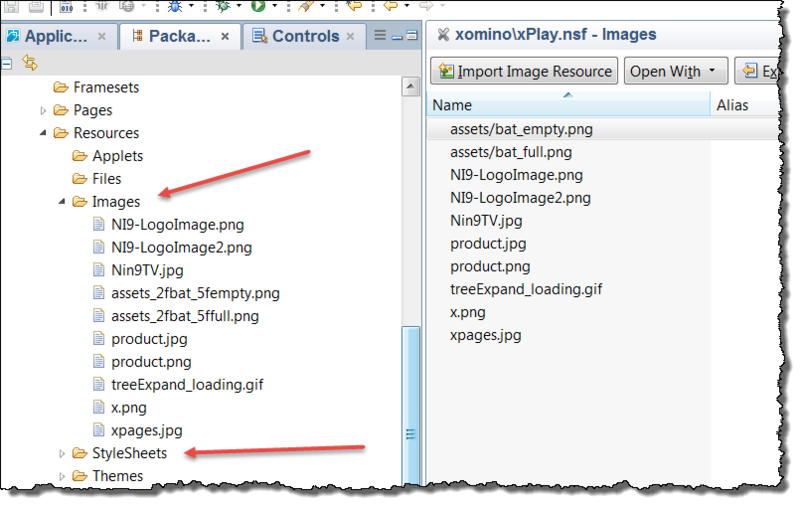 Having all our files as it they were in our database makes our lives harder and certainly harder for non-XPages developer to find our code. Some is in “Code” and the rest is in “Resources”, that doesn’t make sense. 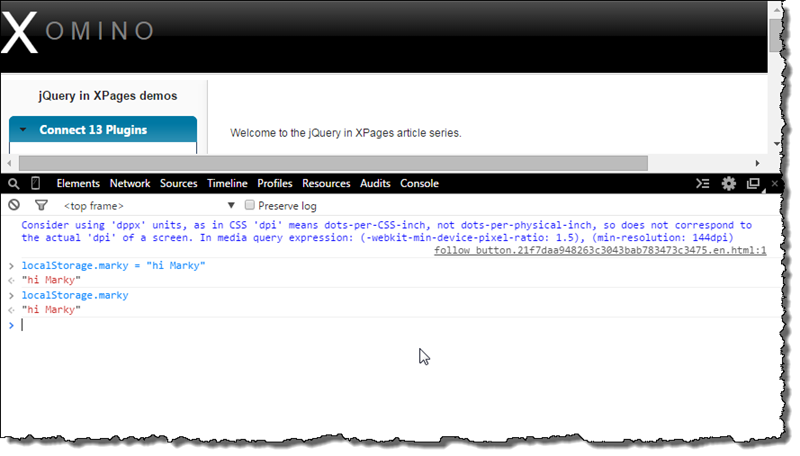 We as XPages developers need to stop using the “database” for files etc and start to use the WebContent like proper web developers. Yes – I know we all have old applications which get modernized and we cannot always do anything about it, but at the same time for new development moving forward this is where I am at. 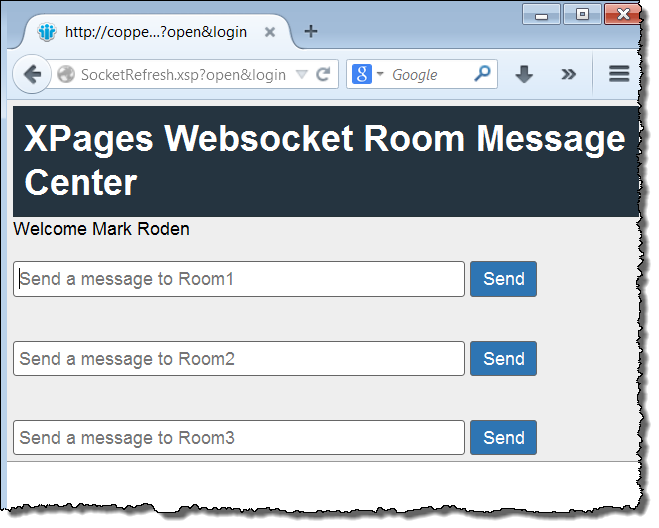 In this article I demonstrate how to create a Websocket message to be broadcast, from a website which is not connected to the Websocket directly. 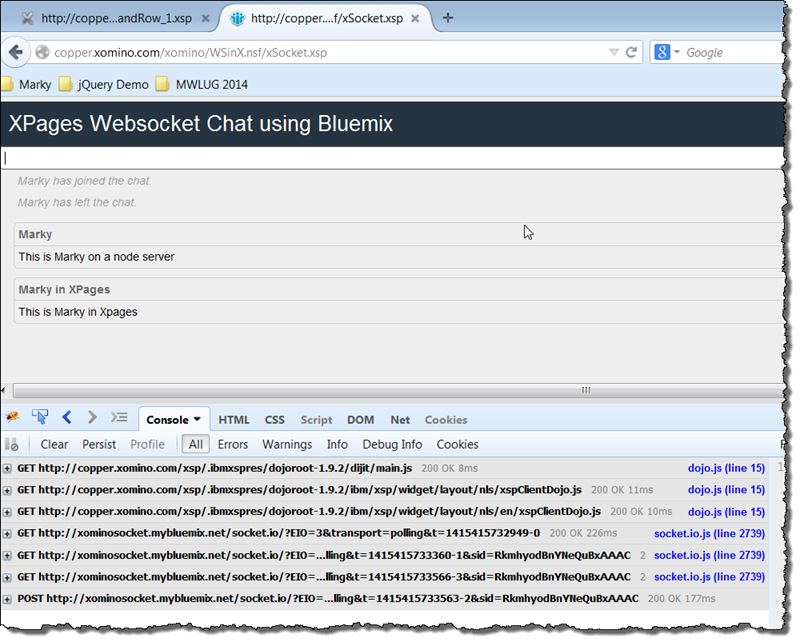 This will be achieved by using a http POST request of the message to a node.js server hosted on Bluemix and having that server then emit a Websocket message out to the application. In the Watson translation service example article I discussed how to create a new POST route within your node application using the simple express construct “app.post”. 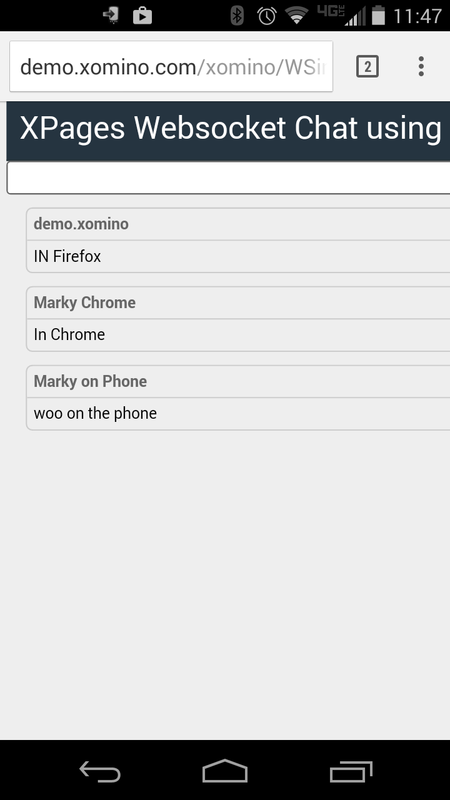 In a similar fashion in this example I am going to POST data from the copper.xomino.com website and therefore I need to add the cors code to the application to allow this. So our target is to recreate that same data Object and send it through to the server socket emitter in the same format. 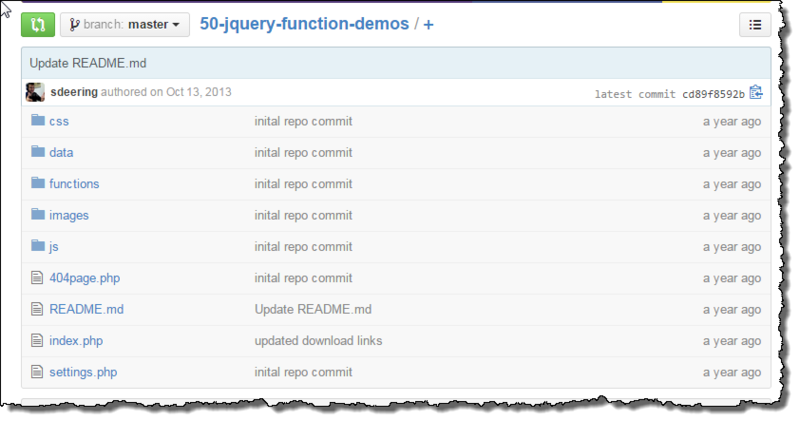 The node.js code from the previous article needs to be updated in a number of ways. 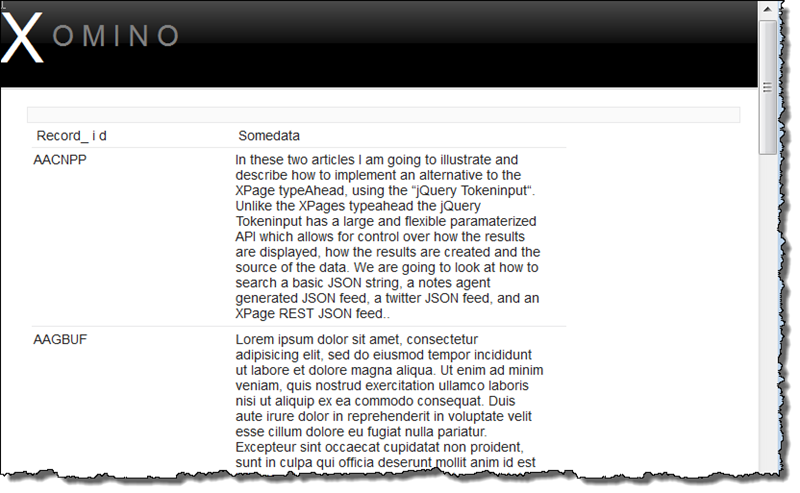 The Watson Translation example used a version of express 3.x. Version 4 is more streamlined and does not contain a lot of middleware. 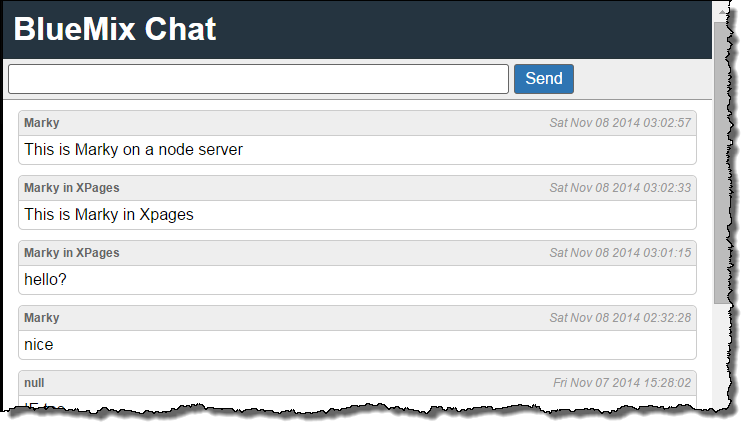 When we attempt to POST data to the node server it cannot be understood because it is encoded by the web browser (by default). For his we need to add the npm module body-parser (not forgetting to include it in the package.json). The app.post also needs to be able to parse the incoming POST and then re-purpose this into a socket emit event. We do this as follows. I also added a check to make sure the req.body was coming through. This was failing before I realized I needed body-parser. 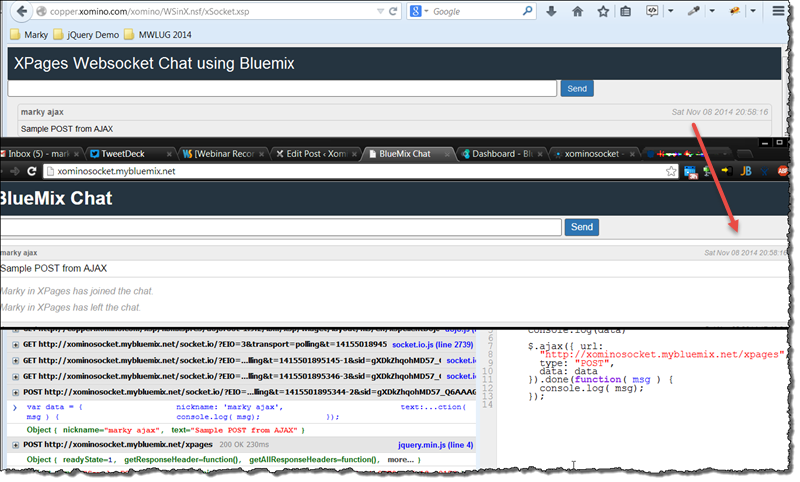 From the next screenshot you can see that the message is them broadcast out to the other client currently connected to the socket, in this case in Chrome. 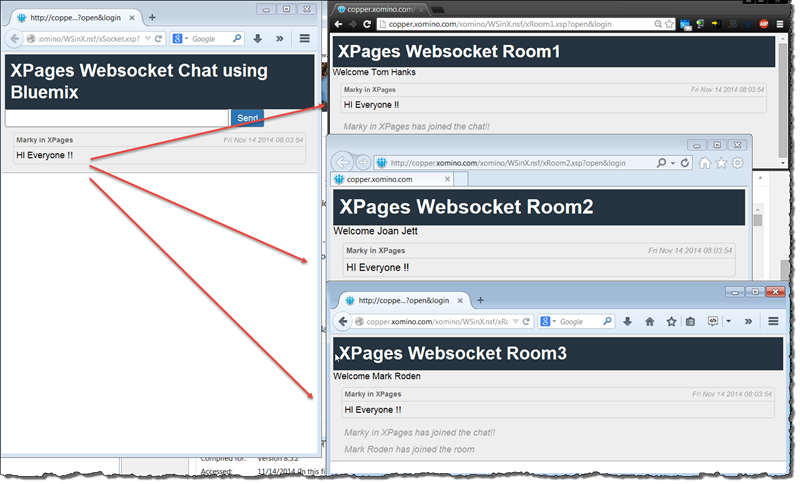 In this article we have seen how we can “create” a websockets emission event on the server by POSTing a message to a separate page within the application. 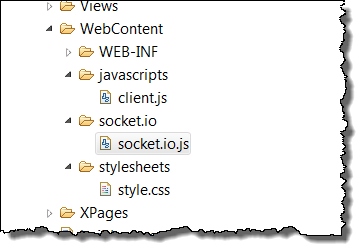 While this may seem pointless (“because why couldn’t I just create a normal websockets message from the page”), what we will see in a future article is the need to emit an event from the server which is not connected to the Websocket and doesn’t need to be. 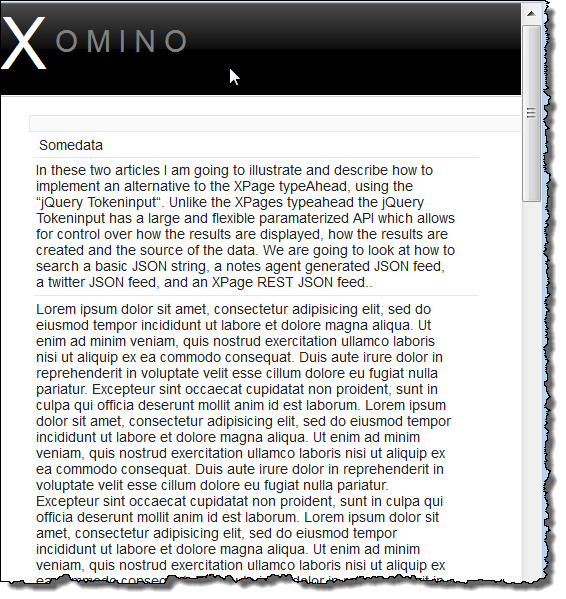 In this article I will demonstrate a method for hiding columns using CSS and making an XPages view Panel pseudo-responsive. 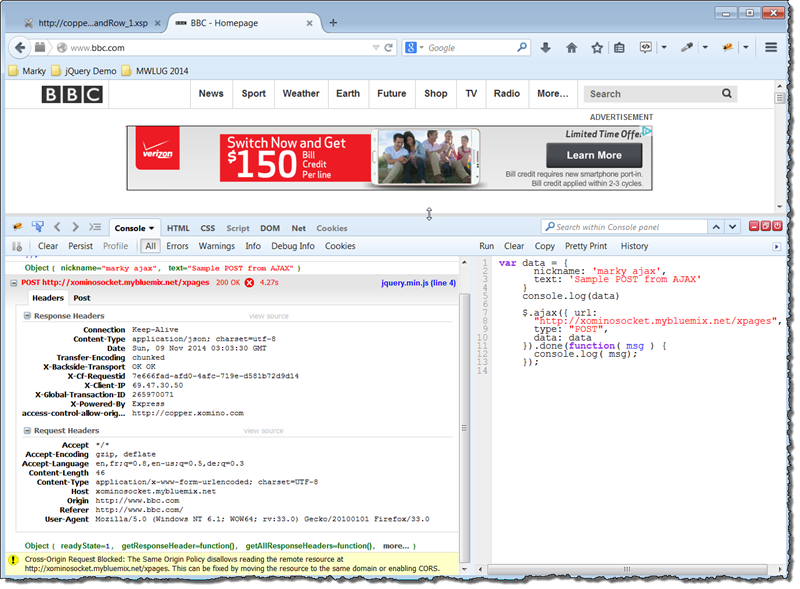 XPages view panels out of the box are not “responsive”, in that they make no attempt to, and do not work well on a mobile device. One solution demonstrated by Stewart Curry is to hide columns as the width of the browser decreases. Hiding the least significant, down to the most when the view space is smallest. This makes sense because you would not want to display 9 columns worth of data on a mobile device anyway. The CSS media queries (IE9 and above) determine the CSS displayed depending on the width of the page (1000px, 768px and 480px in this case). At each stage I remove one column until I am left with just the detail as you can see below.